Fighting Fleas in Your Home - Yes Pest Pros, Inc. Fighting Fleas in Your Home - Yes Pest Pros, Inc. Owning a home comes with a lot of responsibilities. You must maintain your yard. You must also maintain the inside of your house. This includes fixing things when they are broken, updating paint, flooring, and appliances as they age, and pest control service of your home. If you have pets, however, keeping insects, particularly fleas out of your home can be a real challenge. Fleas can be a danger to your pets. And while they may not a big danger to human, they can be quite an annoyance and their bites itch like crazy. Plus, fleas are a rather embarrassing problem to have. No one wants these pesky pests in their home. 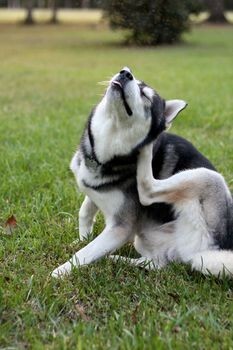 The first step to fighting fleas is to treat your animals. You can treat them yourself by bathing them in flea bath and placing a flea collar on them. If, however, that does not work you will want to take them to the vet to get special solution to put on their neck in order to save them from their flea inhabitants. The next step is to treat your house. In order to do this you will need to wash anything and everything that is fabric including clothes, sheets, bedspreads, etc. You will also need to vacuum all of your carpeted areas and clean your upholstered furniture. s to set off a bug bomb. Either way, you will need to evacuate all of your family, including your beloved pets. Next, you need to treat your yard for the pesky insects. Since your animals roam your yard, you are sure to have fleas within your grass. The process beyond treating your pets can be a lengthy one. You have to research the products to make sure you are using the right ones. Then you have to take the time to do all of the cleaning and treating. However, there is an alternative. You can also hire an exterminator. Bloomington pest control, Elkhart pest control and Granger pest control are great search terms to use as you begin to look around. An exterminator can get rid of your flea problem for you in a much shorter time frame. They will be glad to help you get rid of your flea problem and you will be happy with their expertise and you will be happy to have your home and pets back to normal again.